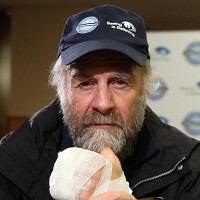 Sir Ranulph Fiennes has told of his frustration at being forced out of the Coldest Journey expedition across Antarctica by frostbite. The explorer, 68, has vowed to support the 2,000-mile trek, which has taken five years to plan, through fundraising. Sir Ranulph suffered frostbite after taking off his outer gloves to fix a ski binding in temperatures of about minus 33C. He was earlier injured in a fall while skiing at base camp training in Antarctica. He told a press conference at a Heathrow Airport hotel after flying back to the UK that he is on pills. A surgeon told him that two of his fingers might require surgery and two definitely would not. Of course, you don't need to be a famous explorer to know the value of good travel insurance. But whether you are crossing Antarctica or flying to France on a day trip, such reliable protection gives you piece of mind. Sir Ranulph's colleagues will continue their quest to conquer the last great polar challenge - to cross Antarctica in winter. They are expected to begin later this month in a bid to raise $10 million (£6,587,180) for a sight charity.